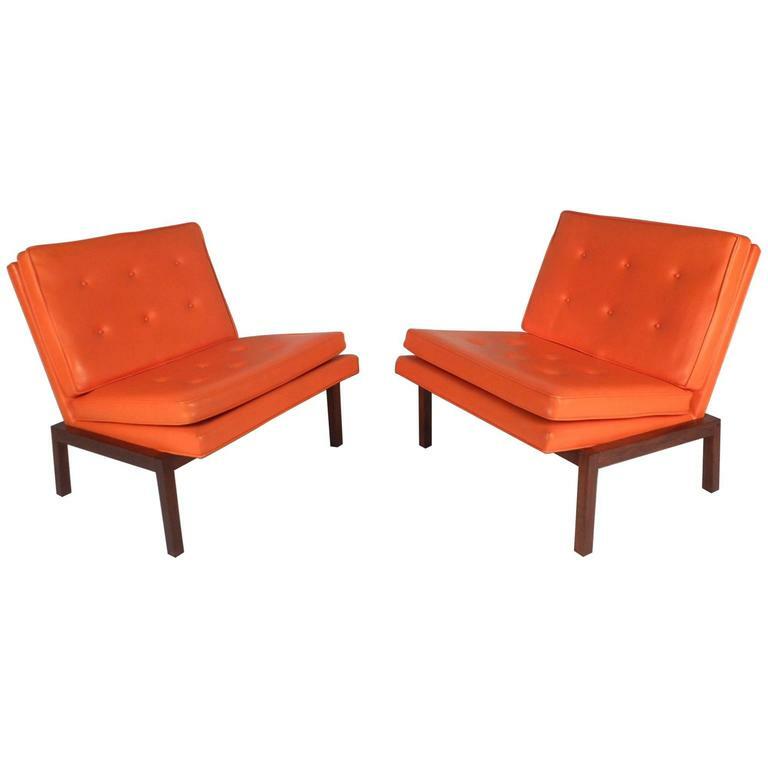 Exquisite pair of vintage modern lounge chairs covered in elegant orange tufted vinyl. This stunning pair features a solid walnut base with angled legs and thick padded cushions. The unique wide design has smaller rear legs so that this piece leans back for optimal comfort. 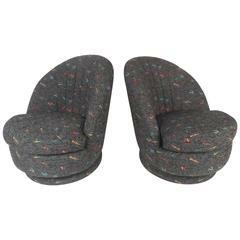 This beautiful mid-century pair of slipper chairs make the perfect addition to any seating arrangement. Please confirm item location (NY or NJ). age appropriate wear, minor scratches on wood, vinyl has some wear and light discoloration on edges. Milo Baughman Mohair scoop lounge chair for Thayer Coggin, 1980. Original camel-colored tufted mohair upholstery over floating mirrored laminate wood base. Labeled, 1980s. A swivel lounge chair on an ebonized ash disc base. Newly upholstered in brown chenille. 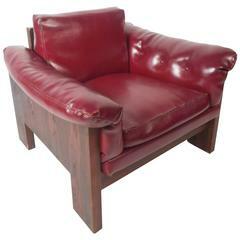 Milo Baughman Thayer Coggin lounge chair. The high curved back with stylized ebonised Greek key motif arms and square legs, Thayer Coggin label. 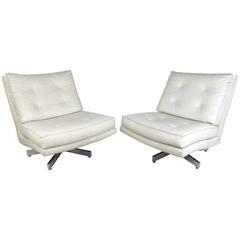 Curved barrel back lounge chairs with chrome-plated plinth base. Chairs tilt and swivel. Upholstered with new foam in a mohair melange velvet. Gorgeous chrome cantilevered cube lounge chair designed by Milo Baughman for Thayer Coggin freshly upholstered in a lush blue velvet. We have three available for purchase.